Download "Service Description: Cisco Prime Home Hosted Services. This document describes the Cisco Prime Home Hosted Services." 2 Cisco Prime Home Base Package Hosted Cisco Prime Home Base TR-069 Mgmt Hosted Cisco Prime Home Analytics Hosted Cisco Prime Home Parental Controls The Cisco Prime Home Hosted Services offer service providers a suite of tools to remotely manage the subscriber home network. Service provider customer care agents use Cisco Prime Home Hosted Services to gain visibility into home network issues of their customer ( Subscriber Customer ) and have more effective means to resolve problems. The Cisco Prime Home Hosted Services also offers a consumer portal site ( Portal ) where the Subscriber Customer can view information regarding their home network and use optional, value added applications such as parental controls. The Cisco Prime Home Analytics Hosted is an optional add-on that provides data analysis and bulk management across multiple devices. 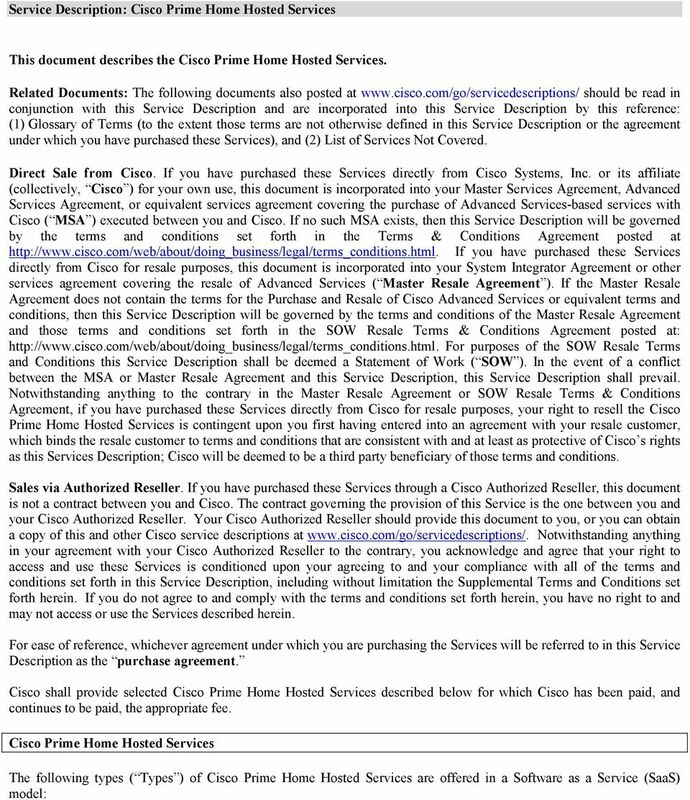 More information regarding these Services can be found on the Cisco Prime Home website: In the event of a conflict between the purchase agreement and this website, the purchase agreement shall prevail. Cisco Prime Home Hosted Services Commercial Terms The Cisco Prime Home Hosted Services are offered in a subscription model, based on a specified subscription duration ( Subscription Term ) and maximum device quantity ( Device Capacity ). You are the Subscriber. A Subscriber is the company purchasing (either directly from Cisco or through a Cisco Authorized Reseller), accessing, and/or using the Cisco Prime Home Hosted Services. You are required to select the appropriate subscription Type(s), Subscription Term, and Device Capacity when placing your order. If you desire to utilize the subscription beyond the purchased subscription Type(s), Subscription Term, and/or Device Capacity limitations, you will need to purchase such additional Type(s), term, and/or capacity. To maintain continuous services, you must purchase any additional Subscription Terms before the expiration of the then current Subscription Term. The new Subscription Term will begin immediately after the expiration of the then current Subscription Term. Compliance Review Cisco has the right, upon reasonable notice, to audit Subscriber s records during normal business hours to ensure Subscriber s compliance with the requirements set forth herein. Cisco will pay the cost of the audit unless it is found that Subscriber is misusing the Service by, for example, exceeding the Device Capacity. Cisco Prime Home Hosted Services Supplemental Terms and Conditions 1) Cisco Prime Home Hosted Services. These Cisco Prime Home Hosted Services Supplemental Terms and Conditions ( Supplemental Terms ) shall govern Subscriber s receipt of the Cisco Prime Home Hosted Services, and are not applicable to any other services provided by or on behalf of Cisco. These Supplemental Terms are hereby incorporated into the MSA or Master Reseller Agreement, if you are purchasing Services directly from Cisco. If you are purchasing these Services from a Cisco Authorized Reseller, these Supplemental Terms should be made a part of that agreement by the Cisco Authorized Reseller. These Supplemental Terms shall take precedence in the event of any conflict between your purchase agreement and these Supplemental Terms. All non-conflicting and additional terms and conditions in the MSA or Master Reseller Agreement, or in your purchase agreement with a Cisco Authorized Reseller, are applicable to this purchase and shall remain in effect. 2) Orders. The Service described in this Service Description is purchased by the placement of an Order. The Order shall identify the type, quantity, and duration of Service being ordered and the associated fees. An Order is effective only when properly submitted by Subscriber, or if applicable Cisco Authorized Reseller, to Cisco and provisioned by Cisco. Subscriber may be required to provide additional information in order to register for and/or use certain Services. Subscriber, or if applicable, the Cisco Authorized Reseller, warrants that all such information is accurate. 3 3) Changes to Service. Cisco may, at its sole discretion and from time to time, enhance and/or expand the features of a Service at no additional cost to Subscriber. Cisco may also, at its sole discretion and from time to time, make available additional features and/or functionalities to a Service which may, but are not required to, be added to a Service by Subscriber at an additional cost. Further, Cisco may elect to discontinue the availability of a Service, provided that such discontinuance will be effective no earlier than expiration of the then-current Subscription Term as specified in the applicable Order. Subscriber agrees that Cisco is free to use and incorporate into Cisco products and services any suggestions, ideas, recommendations, bug reports, or other feedback that Subscriber provides to Cisco without payment of compensation to Subscriber. 4) Survival of Supplemental Terms. The following provisions will survive the expiration or termination of these Supplemental Terms: any payment provisions set forth in the Order (as to amounts due and owing as of these Supplemental Terms expiration or termination date) and Sections 4, 5, 6, 8, and 9. Upon any termination of these Supplemental Terms, Subscriber must cease any further use of the Service. 5) Subscriber Responsibilities. a) In performing the Services, Cisco may instruct Subscriber to perform certain tasks or checks relating to Subscriber s network. Subscriber will, at its expense, perform all such checks and tests. Subscriber will also provide at no cost to Cisco, or its authorized representative, reasonable access to Subscriber s networking equipment in connection with the Cisco Prime Home Hosted Services. Subscriber will not be required to furnish specialized equipment or know-how. b) Subscriber is responsible for obtaining all third party approvals required for Cisco to perform any Service under this Service Description. Cisco will not be responsible or otherwise liable for any failure to perform the Services to the extent caused by Subscriber s failure to obtain such third party approvals or any third party otherwise prevents Cisco from performing the Services. c) Except as expressly permitted herein, Subscriber will not resell, distribute, use on a timeshare or service bureau basis, or otherwise directly generate income from the Services or any related web sites ( Sites ) or provided documentation ( Documentation ). Subscriber will not, directly or indirectly, make derivative works of, disassemble, decompile or reverse engineer any Service, Site, Portal, or Documentation, or any component of the foregoing (except to the extent expressly permitted by law). d) Subscriber will be responsible for compliance with all privacy, data control or use laws and regulations relating to its use of the Services, including without limitation any data provided by or to Cisco hereunder. Subscriber acknowledges the potential privacy and other issues associated with the collection and use of such data. Subscriber warrants and covenants that it will comply with all laws (including, without limitation, copyright laws, privacy laws and import and export laws) applicable to Subscriber or its use of the Services. In addition Subscriber is responsible for obtaining any permits or approvals relating to its use of the Services, including without limitation any permits or approvals relating to transactions requiring its Subscriber s credit card information or other personally identifiable information. It is the sole responsibility of Subscriber to ensure it has the right to use all features of the Service in Subscriber s jurisdiction. Cisco may modify or not make available Service or Service features to comply with applicable laws and regulations. Cisco technology and the Service are subject to U.S. and local export control laws and regulations. Subscriber shall comply with all laws and regulations governing use, export, re-export, and transfer of products, technology and Service and will obtain all required U.S. and local authorizations, permits, or licenses. Subscriber certifies that Subscriber and its customers will not use the Service from within an embargoed country. Subscriber certifies that it is not listed on, and will not be listed on during the Subscription Term, the U.S. Department of Commerce s Denied Persons List or affiliated lists, on the U.S. Department of Treasury s Specially Designated Nationals List or on any U.S. Government export exclusion lists. 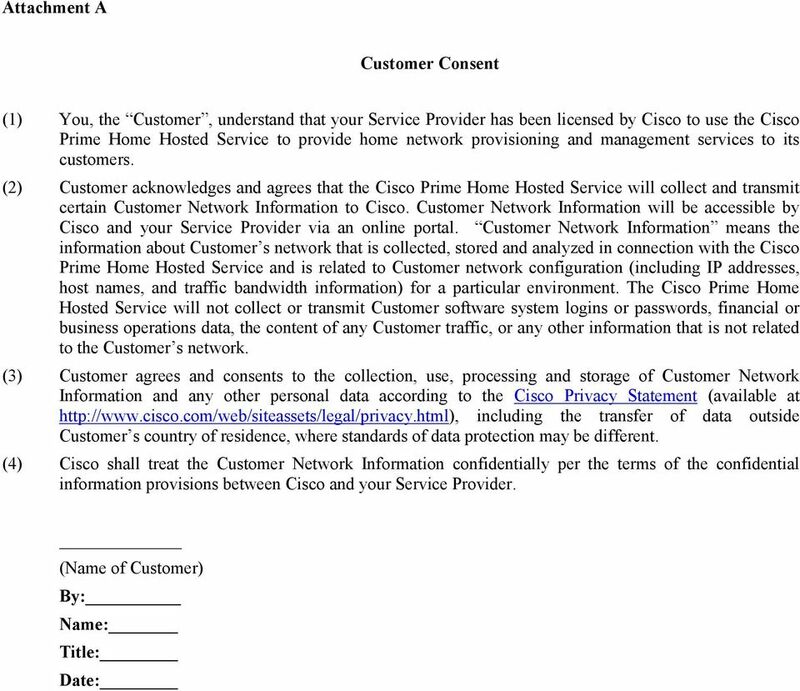 e) Before using the Cisco Prime Home Hosted Services to collect, use, or any analyze any Customer Network Information (as defined in Attachment A hereto) of a Subscriber Customer, Subscriber will refer the Subscriber Customer to the Customer Consent shown in Attachment A and obtain Subscriber Customer s written consent thereto. Subscriber hereby acknowledges, agrees and represents to Cisco that it has obtained consent from each applicable Subscriber Customer to collect, use and analyze Customer Network Information. f) Subscriber will not use the Services to send spam, viruses or malware. g) Subscriber understands the Services are hosted by Cisco via a network utilized by Subscriber and other Cisco Subscribers; Subscriber will not intentionally or unintentionally access data not owned by Subscriber or otherwise related to Subscriber s use of the Services, or log into, or attempt to log into, a server or account which Subscriber is not authorized to access. 4 h) Subscriber will not attempt to probe, scan or test the vulnerability of a system or breach security or authentication measures without prior, express, written authorization. i) Subscriber is responsible for handling all communication, technical support for, and business relations with its customers, including without limitation responding to inquiries and technical questions. j) Except when Subscriber s Access Credentials (as defined below) are obtained by a third party as a result of a material breach of Cisco s physical or computer system security arising from circumstances within Cisco s control, Subscriber agrees that Subscriber is solely responsible for maintaining the confidentiality of Subscriber s Access Credentials and solely responsible for any unauthorized usage. Subscriber agrees to immediately notify Cisco of any unauthorized use of Subscriber s subscription of which Subscriber becomes aware. Access Credentials are the user names, passwords, or other credentials used by Subscriber to gain access to the Cisco Prime Home Hosted Services. k) Subscriber is responsible for any catastrophic security events that result from any unauthorized configuration of the Service components by Subscriber s personnel. l) Subscriber will provide all computers, connectivity, software, configurations, customizations and other items and services required to access and use the Services. m) Subscriber will not alter or remove any copyright, trademark, trade name, or other proprietary notice, legend, symbol, or label appearing on or in copies of any Services or any Sites, Portal, or Documentation. Any symbols, trademarks, tradenames, and service marks adopted by Cisco to identify the Services or any Sites, Portal, or Documentation belong to Cisco and Subscriber will have no rights therein. Subscriber will not obtain or attempt to obtain anywhere worldwide, directly or through any third party, any rights to any trade names, service marks, symbols, trademarks or URLs that are the same or confusingly similar to the trade names, service marks, symbols, trademarks or URLs used by Cisco, any copyrights in Services or Documentation including any derivative works thereof, or any patents involving the functionality, manufacturing, configuration, appearance or use of Services or Documentation. 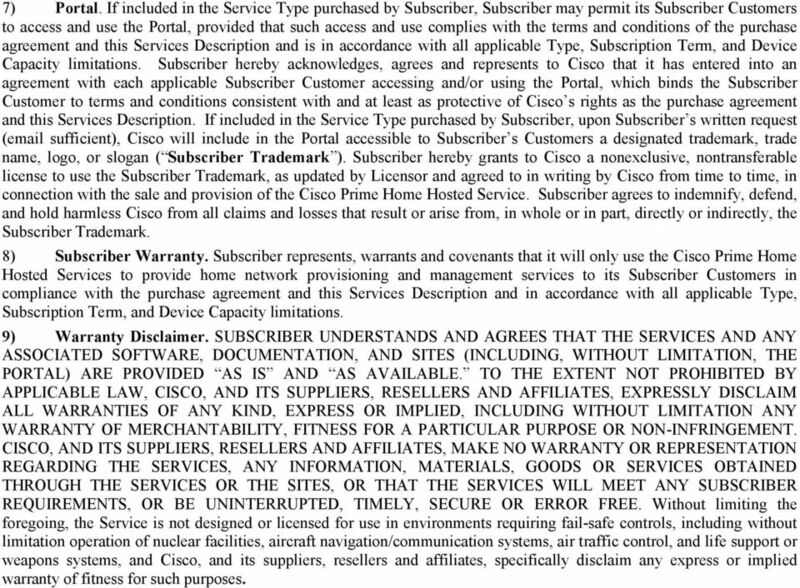 n) Subscriber agrees that Cisco may suspend or terminate Subscriber s access to the Services without notice if: (i) Cisco determines that Subscriber has violated the purchase agreement or this Service Description, or (ii) Cisco is required to do so by any court or government authority in any country. Cisco may, upon such termination, deactivate or delete Subscriber s subscription and any related data, information, and files, and bar any further access to such data, information, and files. Such action may include, among other things, accessing your content or data and/or discontinuing your use of the Services without refund or compensation. Cisco will issue a refund when appropriate. 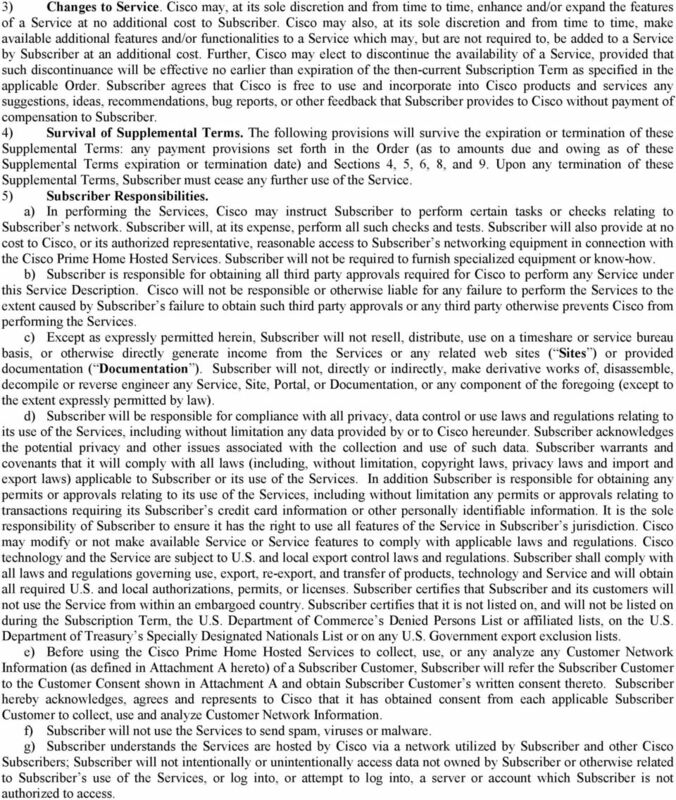 Subscriber agrees that Cisco has no obligation to monitor Subscriber s use of the Services but has the right to do so to ensure Subscriber s compliance with this the purchase agreement and this Service Description, or to comply with any law, order, or requirement of any court or government authority in any country. The failure of Subscriber to comply with Subscriber s responsibilities set forth above may be deemed a material breach of the purchase agreement and this Service Description. Cisco reserves the right to suspend or terminate access to the Services upon notice of a violation of such responsibilities. 6) Subscriber Data. Cisco does not own any data, information or material that Subscriber submits to/via the Services, Sites, or Portal, or data gathered by/via the Services, Sites, or Portal from Subscriber and/or Subscriber Customer equipment in the course of using the Services (collectively, Subscriber Data ). Subscriber, not Cisco, will have sole responsibility for the accuracy, quality, integrity, legality, reliability, appropriateness, and right to use the Subscriber Data. Cisco will have the right to use Subscriber Data in aggregate or anonymous (i.e. non-personally identifiable) form for data gathering, analysis, and service enhancement purposes; provided, that Cisco shall not advertise, market or otherwise make known to others the name or logo of Subscriber, without the prior written consent of Subscriber. Subscriber grants to Cisco a limited, non-exclusive, world-wide, royalty fee, sublicensable (so Cisco affiliates, contractors, resellers and partners can deliver the Service), license to use, modify, publicly perform, publicly display, reproduce and distribute the Subscriber Data solely for all reasonable and necessary purposes contemplated herein and for Cisco to perform the Services as contemplated hereunder. By using and/or accessing the Services, Sites, or Portal, Subscriber agrees and consents to the collection, use, processing and storage of Subscriber Data and Customer Network Information (as that term is defined in Attachment A) according to the Cisco Online Privacy Statement located at which is incorporated into this Service Description by this reference, and, for European Economic Area (EEA) customers, to the transfer of such information to a location outside the EEA. 5 7) Portal. If included in the Service Type purchased by Subscriber, Subscriber may permit its Subscriber Customers to access and use the Portal, provided that such access and use complies with the terms and conditions of the purchase agreement and this Services Description and is in accordance with all applicable Type, Subscription Term, and Device Capacity limitations. 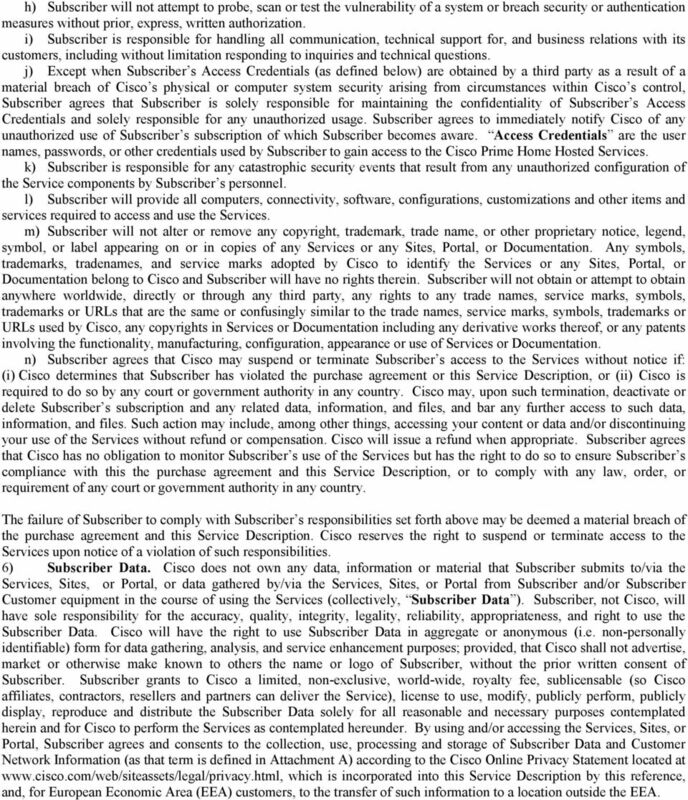 Subscriber hereby acknowledges, agrees and represents to Cisco that it has entered into an agreement with each applicable Subscriber Customer accessing and/or using the Portal, which binds the Subscriber Customer to terms and conditions consistent with and at least as protective of Cisco s rights as the purchase agreement and this Services Description. If included in the Service Type purchased by Subscriber, upon Subscriber s written request ( sufficient), Cisco will include in the Portal accessible to Subscriber s Customers a designated trademark, trade name, logo, or slogan ( Subscriber Trademark ). Subscriber hereby grants to Cisco a nonexclusive, nontransferable license to use the Subscriber Trademark, as updated by Licensor and agreed to in writing by Cisco from time to time, in connection with the sale and provision of the Cisco Prime Home Hosted Service. Subscriber agrees to indemnify, defend, and hold harmless Cisco from all claims and losses that result or arise from, in whole or in part, directly or indirectly, the Subscriber Trademark. 8) Subscriber Warranty. 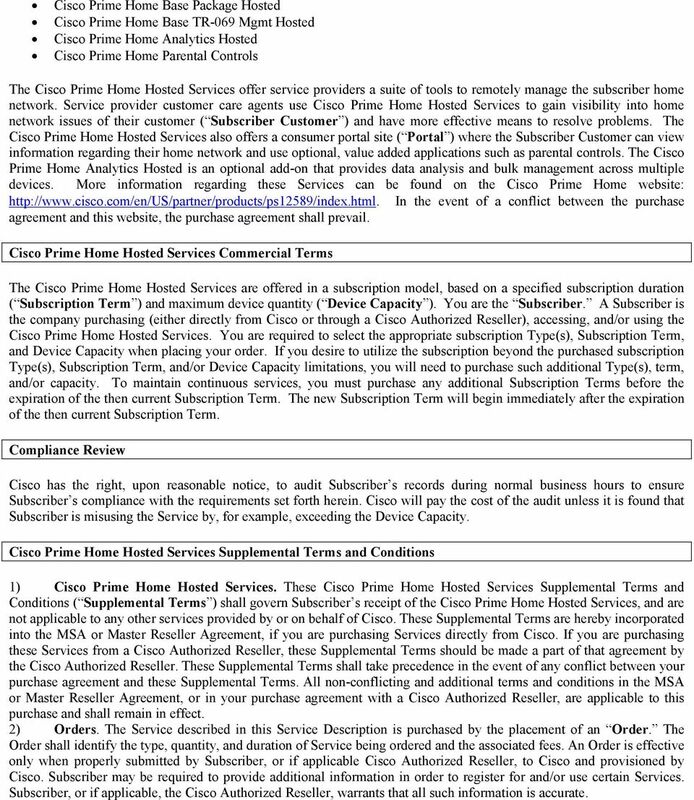 Subscriber represents, warrants and covenants that it will only use the Cisco Prime Home Hosted Services to provide home network provisioning and management services to its Subscriber Customers in compliance with the purchase agreement and this Services Description and in accordance with all applicable Type, Subscription Term, and Device Capacity limitations. 9) Warranty Disclaimer. SUBSCRIBER UNDERSTANDS AND AGREES THAT THE SERVICES AND ANY ASSOCIATED SOFTWARE, DOCUMENTATION, AND SITES (INCLUDING, WITHOUT LIMITATION, THE PORTAL) ARE PROVIDED AS IS AND AS AVAILABLE. TO THE EXTENT NOT PROHIBITED BY APPLICABLE LAW, CISCO, AND ITS SUPPLIERS, RESELLERS AND AFFILIATES, EXPRESSLY DISCLAIM ALL WARRANTIES OF ANY KIND, EXPRESS OR IMPLIED, INCLUDING WITHOUT LIMITATION ANY WARRANTY OF MERCHANTABILITY, FITNESS FOR A PARTICULAR PURPOSE OR NON-INFRINGEMENT. CISCO, AND ITS SUPPLIERS, RESELLERS AND AFFILIATES, MAKE NO WARRANTY OR REPRESENTATION REGARDING THE SERVICES, ANY INFORMATION, MATERIALS, GOODS OR SERVICES OBTAINED THROUGH THE SERVICES OR THE SITES, OR THAT THE SERVICES WILL MEET ANY SUBSCRIBER REQUIREMENTS, OR BE UNINTERRUPTED, TIMELY, SECURE OR ERROR FREE. Without limiting the foregoing, the Service is not designed or licensed for use in environments requiring fail-safe controls, including without limitation operation of nuclear facilities, aircraft navigation/communication systems, air traffic control, and life support or weapons systems, and Cisco, and its suppliers, resellers and affiliates, specifically disclaim any express or implied warranty of fitness for such purposes. BLUEWAVE COMMUNICATIONS INTERNET SERVICE AGREEMENT Read This Internet Service Agreement Carefully Before Using Our Internet Services. SYMANTEC SOFTWARE SERVICE LICENSE AGREEMENT Norton 360 IMPORTANT: PLEASE READ THE TERMS AND CONDITIONS OF THIS LICENSE AGREEMENT ( LICENSE AGREEMENT ) CAREFULLY BEFORE USING THE SOFTWARE (AS DEFINED BELOW).